Bit Reader USB is available for US$120 plus shipping by sending me a message through my contact form indicating you'd like to purchase it. I will arrange a payment method with you once I receive your request (PayPal is preferred). You can also send any questions you have about Bit Reader USB to me using the same contact form. Many computers do not have gameports or even parallel ports, leaving USB as the primary option for input devices. These instructions will allow you to read data from a magnetic stripe reader on any computer that supports USB and the keyboard HID standard (which all modern operating systems support). This adapter converts electrical signals from a TTL magnetic stripe reader into 1's and 0's that are "typed" on the USB keyboard device that the adapter registers when it is plugged into a computer. This string of 1's and 0's can be fed into Stripe Snoop using ss -i or saved to disk for later analysis. 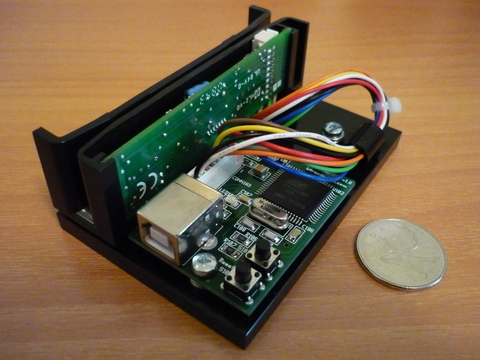 TTL Magstripe Reader - These can be found on the Internet for from sites like Digikey, Jameco, and Newark. Personally, I use Omron's V3B family of readers, specifically the V3B-4K, since it offers exactly what we need. Expect to spend ~$15-30. If you are using a V3B-4K, you may want to get a 5-pin header (similar to a floppy drive power connector) so you can plug the V3B-4K into this header. Currently the firmware used for this project requires that your card reader have a card loaded pin (the V3B-4K is such a reader). Atmel AT90USBKey - Use Atmel's inventory check for a list of distributors. Except to spend ~$30. Wiring - I recommend using solid 24 gauge wire. It fits nicely through the holes on the AT90USBKey, making soldering easier. You won't need very much of this; just enough to get from the AT90USBKey to your magstripe reader. The AT90USBKey comes with a reasonably long USB cable so you don't need to worry about the wiring reaching to the back of your computer. If you can't find 24 gauge wire, use a higher gauge (ie. smaller) wire. Odds and ends - You will need solder, a soldering iron, a wire cutter/stripper, and possibly a hot glue gun. I use the hot glue to secure my soldered wires, and make sure I don't get any shorts. Time - The length of time required varies widely based on how much soldering experience you have and how much re-soldering is required. Give yourself at least an hour. Use the data sheet for your TTL reader to determine which pins are 5V, ground, data, clock, and card loaded. For the V3B, the data sheet is available here. The pinouts are on page 3. If you don't have a V3B, check the manufacturer's web site for a data sheet. Connect the pins on the TTL reader to the pins on the AT90USBKey. The firmware for the AT90USBKey is configured to use the following pin mapping. You can ignore the AT90USB1287 name if you aren't planning to change the firmware to use different pins. The AT90USBKey Hardware User Guide shows where port C is located on the AT90USBKey. This is shown in Figure 2-1 on page 5. If you want to see the mappings from AT90USBKey pins to AT90USB1287 names (ie. if you want to modify the firmware to use different pins), see the schematic on page 19 of the user guide. If you are using a V3B-4K, I suggest soldering wires from the AT90USBKey to a 5-pin header, such as a 53375-0590 or a 53426-0510. You can then plug the V3B-4K directly into the header instead of having to snip the wires and lose the 51102-0500 plug that the V3B-4K has. 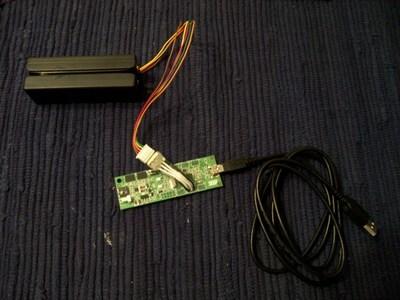 If you are using a TTL reader that doesn't come with attached wires, then you will have to solder the wires directly to the terminal on the TTL reader's PCB, with the other end of wires soldered to the AT90USBKey according to the above mapping table. 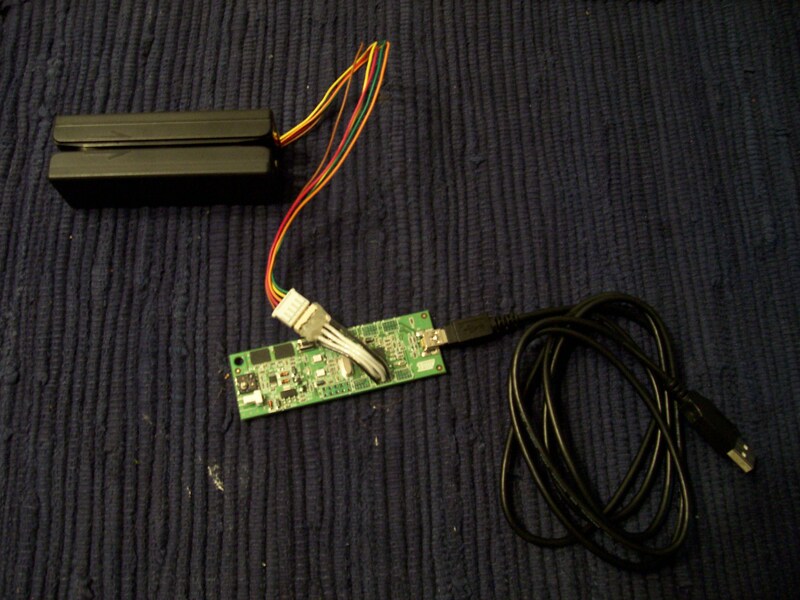 Once you have the DFU tool installed, load the firmware onto the AT90USBKey using the DFU tool's instructions. This usually involves holding the HWB button on the AT90USBKey and then pressing the RST button. Doing this causes the device to reboot in firmware update mode. This process is described in section 2.5.1 of the AT90USBKey Hardware User Guide, which is on page 13. After the firmware has been loaded, reset the device by pressing the RST button. Now the AT90USBKey is ready for you to swipe a card. There are many Stripe Snoop users on the Stripe Snoop development mailing list who would be happy to help with any issues you encounter with these instructions. Don't hesitate to ask if you have a question. Dean Camera, the creator and maintainer of the MyUSB project, deserves a big thank-you for the time he spent reviewing my code and integrating it into his project. I couldn't have done this project without him. This page is based on the Standard Game port based Reader page, created by Acidus. The Stripe Snoop software referenced in this document was created by Acidus.